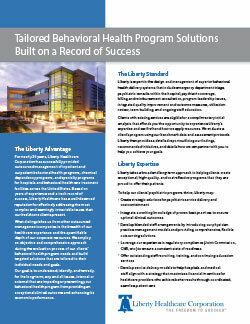 Liberty Healthcare has a distinguished history of designing and implementing customized behavioral health solutions that target the unique needs of each customer, while making the most efficient use of available resources – whether in a hospital, residential, or community setting. We apply best practices with compassion and operational skill to improve the quality of life for people with serious and persistent mental illness, intellectual and developmental disabilities, co-occurring disorders, and involvement with the criminal justice system. 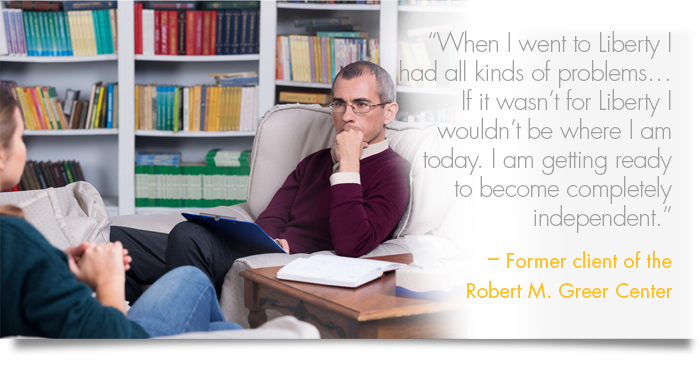 Liberty also specializes in forensic mental health services for adults and youth, including the operation of secure treatment facilities, restoration of competency programs in hospital and jail-based settings, and community management and reintegration of challenging populations, including assertive community treatment and re-entry programs. Many of these programs require highly specialized processes, professionals, and levels of logistical support and population-specific resources that few organizations possess. Liberty is an industry leader known for its innovation and diligence in meeting any challenge.